Der Artikel Musik für Horn & Klavier wurde in den Warenkorb gelegt. 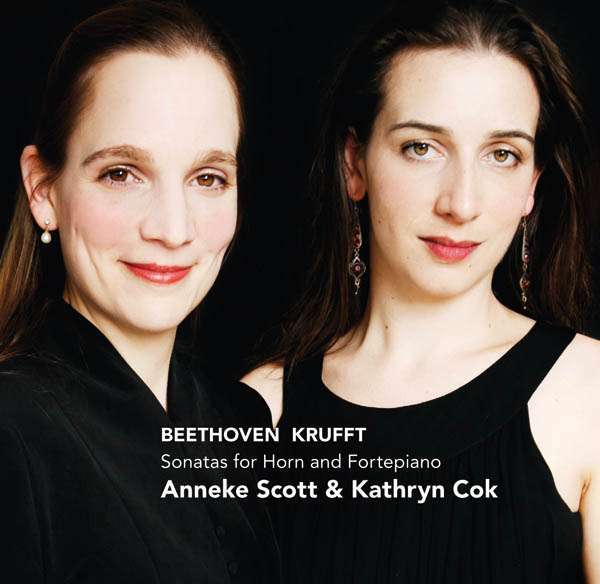 Anneke Scott, die wohl derzeit weltweit beste Naturhornspielerin, hat sich mit der Kathryn Cok am Hammerflügel zusammengetan, um sehr seltene Kammermusik-Preziosen des frühen 19. Jahrhunderts auszugraben. Sie widmen sich diesen anspruchsvollen Werken sehr einfühlsam und virtuos. Advances in horn technique during the eighteenth century created an era of virtuosi whose talents moved composers to write for them. Austria, and in particular Vienna, attracted a great number of these artists and the nineteenth century saw a new generation of musicians who composed and collaborated on works that promoted the instrument in fascinatingly new ways. 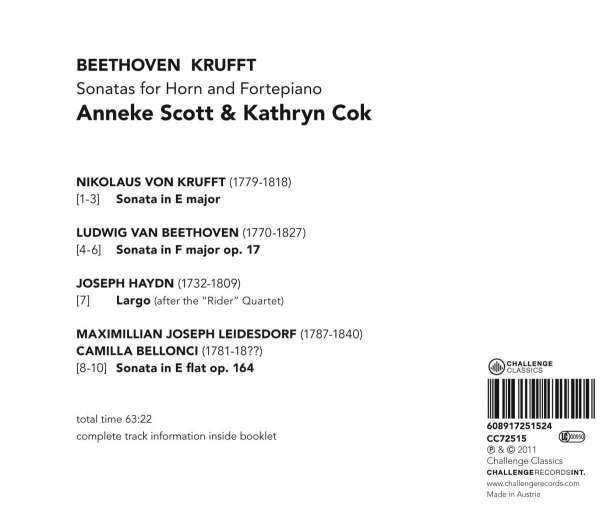 Krufft was a prolific composer who wrote a number of sonatas including one for fortepiano and horn. On his early death in 1818 he was described by the Allgemeine Musikalische Zeitung as “a pianist of rare talent and precision, a composer of study and spirit”. Like many other Viennese musicians of this time, Krufft studied law at the University of Vienna and then combined a career as a musician with a post in civil service. The life of Jan Václav Stich has been described as “resembling that of a novel” (H. Kling). Born into a family of serfs, his early talent caught the attention of the local count who arranged for him to have specialist training. The high quality of wind musicians emerging from Bohemia at this time led Charles Burney to describe Bohemia as the “Conservatory of Europe”. Stich later absconded and, going under the name of Giovanni Punto, became one of the biggest names in music, travelling the length and breadth of Europe. Beethoven’s Sonata Op. 17 for fortepiano and horn, thought to be the first composition for this combination, contains highly characteristic writing for both instruments. Punto’s fame is reflected in a review of an early performance of the work in which a critic asked “Who is this Beethoven? His name is not known to us. Of course, Punto is very well known”. Juxtaposed with the three sonatas on this disc is something of a curiosity. Arrangements and transcriptions of works were incredibly popular in Vienna during the early nineteenth century. Though the combination of horn and fortepiano might not be the most obvious choice for an arrangement of the Largo of Haydn’s String Quartet Hob II;74 (the “Rider” quartet) the range of colours and the flexibility of both instruments chosen by the anonymous arranger suits the movement’s elegant melody and subtle nuances. The final composer on this disc, Leidesdorf, shared with Krufft and Beethoven the guidance of Johann Albrechstberger as a teacher. Haydn rated Albrechtsberger’s skills highly describing him as “the best teacher of composition among all present-day Viennese masters”. Sadly, today Leidesdorf is remembered mainly for his publishing house Leidesdorf und Sauer but was well known as a composer, pianist and guitarist during his lifetime. Schubert described him as a “truly deep and good being” but also “hugely melancholic”. Unusually this “Sonata pour pianoforte et cor concertans”, published in 1824, includes two names on the frontispiece; “Bellonci und M. K.Leidesdorf”. Camilla Bellonci was an Italian horn player who settled in Vienna where he played for the KärntnertorTheatre and the Imperial Hofkapelle. The highly virtuosic writing for both instruments suggests a great deal of collaboration in the compositional process which may justify the “equal billing” of Bellonci and Leidesdorf on the frontispiece.